First — assuming you’re a vi user — you need to download MacVim (one of several vis for the Mac, but one I know looks the part and works well), and install it. Next, you need a small shell script to start up MacVim from Thunderbird (you can’t just point the Thunderbird plugin at MacVim.app — it doesn’t work like that). exec open -W -a macvim "$@"
Next, download and install the external editor plugin for Thunderbird from here. Note: If you’re using Safari then you may hit a problem at this point. The download is supposed to be a single .xpi file and indeed, that’s what’s offered by the download link. Unfortunately Safari notices that’s it’s really a zip file, and so renames it to <file>.xpi.zip You need to rename the file back — strip the .zip off the end of the file name. Apart from the above caveat, install the plugin in the usual way, then configure it — not to use MacVim itself, but to use the dovim script you placed in /Applications and you’re almost there. and that should be it, you can now drop into vi from within Thunderbird‘s email editor. Thanks for the tip, however this doesn’t work for me for a very good reason! I frequently have multiple instances of macvim running with 5-10 tabs open in each instance. I also write emails all day long. This method requires me to close all of my macvim instances just to send an email! This is much less convenient than simply composing in macvim, and then pasting into TB. Hi Ben — I can see that’s a problem for you and others who use macvim a fair bit. Note that the code that starts with pid= and ends with print $1 is all one long line (this should happen anyway if you cut and paste). Your solution works provided that the “Launch Vim processes in a login shell” option is not selected. But Vim-Latex, which I use frequently, needs that option selected in order to work. Any idea as of how to get it to work with this option selected? Thanks for this post; it got me on the right track. I would suggest, though, that it is easier to not use either the open command in the shell script nor a shell script at all. You can evoke MacVim directly from the command line. Here is what I am using in the text editor field. The open command was causing more then a 30 second delay for me when I evoked the shell script. The direct call to the executable takes about 1 second. The arguments are the same as from a real unix environment: -g to use the GUI, and -f to not fork into the background (the same reason for adding the -W in the shell script). The last argument ‘+/^-=-/+1’ starts me at the first blank line after the headers. 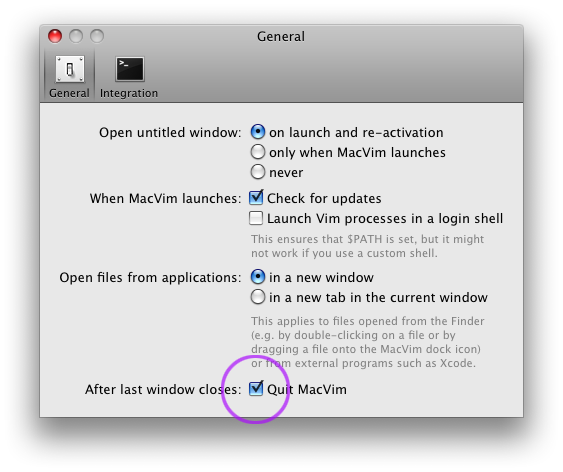 Lastly, if the macvim app name has spaces in it, you should rename it so it does not have spaces. Spaces in the name makes it harder for the unix command line to find the executable.